Who wouldn’t want kisses from this sweet pup? Beautiful but snowy, slushy and icy run through Wash Park. the past few weekends, well except last Sunday, have boasted temps in the 50s and 60s, with some days reaching near 70! It’s been ideal weekend running weather, and I am so grateful. With this in mind, I completed the last two 5ks for the Denver Race Series. On Super Bowl Sunday, I strapped on my Yak Trax (which have been the unsung heroes of my winter running routine), bundled up, and hit the roads of Wash Park the morning after a decent snow storm. 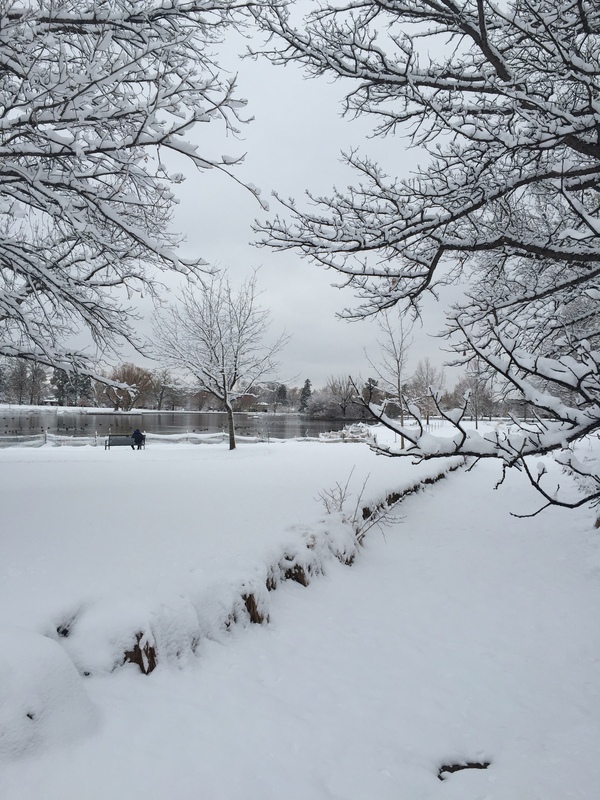 Of course all the snow melted within the next few days, but it was a gorgeous winter wonderland run nonetheless. 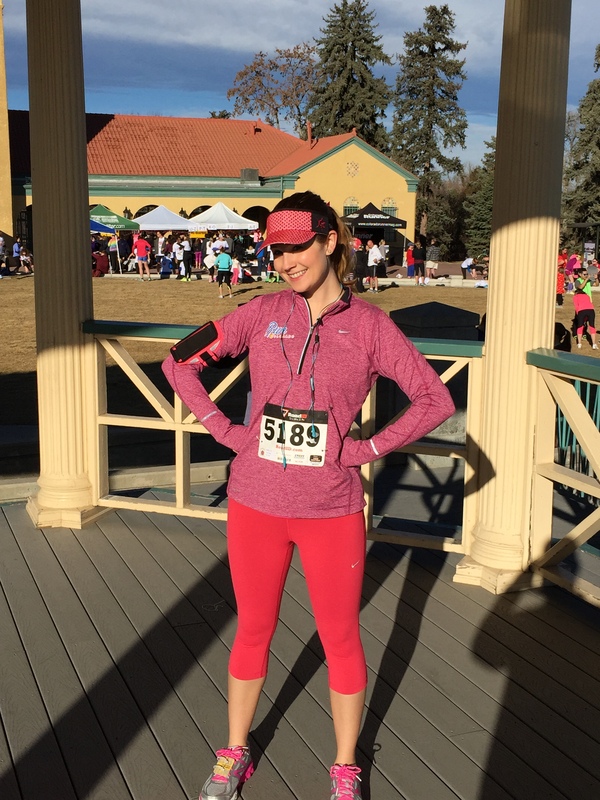 This past weekend, the hubby decided to join me for the Valentine’s Day 5K: Love on the Run. It seemed so appropriate that he was there! It was a stunningly gorgeous day and I was so happy to have the chance to run around Wash Park with him. After the race, we did another 2.1 miles to round off at 5.2 miles. 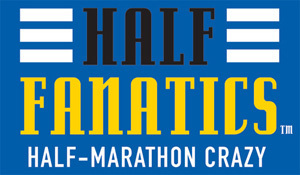 We’re trying to pile on the miles each weekend as we near the March 1st That Dam Half Marathon. When the weather is nearly 70 degrees, there’s really no excuse not to take advantage of it! On a high note, the hubs and I have not only been running quite a bit more, but we’ve been trying out great eateries around the Denver metro area. Denver really is an up-and-coming foodie fantasy land, so it makes sense that I run so I can eat. Let’s be honest, don’t we all, really? Given that the hub’s birthday was last week, we went to TWO restaurants in honor of his last year in his 20s. First we dined at our favorite steak house, Del Frisco’s. Although a chain steak house, it’s a constant delight. We have found a favorite waitress, know the menu like the back of our hands, and always order the Del’s Delight dessert at the end. In every way, we always have the perfect meal. The Ocean Prime Berries and bubbles cocktail, which actually bubbles!! You must try it. The second restaurant we tried out with our foodie Friday friends, Scott and Danielle. Naturally we dined on Friday at a restaurant I have often overlooked, but pass by nearly daily: Ocean Prime. Now I know what you’re thinking, “Isn’t Colorado a land-locked state?” Well, yes… unless California, Nevada and Utah suddenly erode into the Pacific Ocean, we are still situated rather more in the middle of the country, albeit the west. However, you’ve got to love the ease of moving fresh food quickly around the country, and there are some sensational seafood restaurants in Denver. Ocean Prime did not disappoint. Beast+Bottle has been one of my favorite Denver meals to date. animal (and vegetable/fruit for that matter) provides a most delicious experience. We had previously gone for brunch with our dear friends, Peter and Ade, but decided this would give us the delectable dinner we’d been craving. 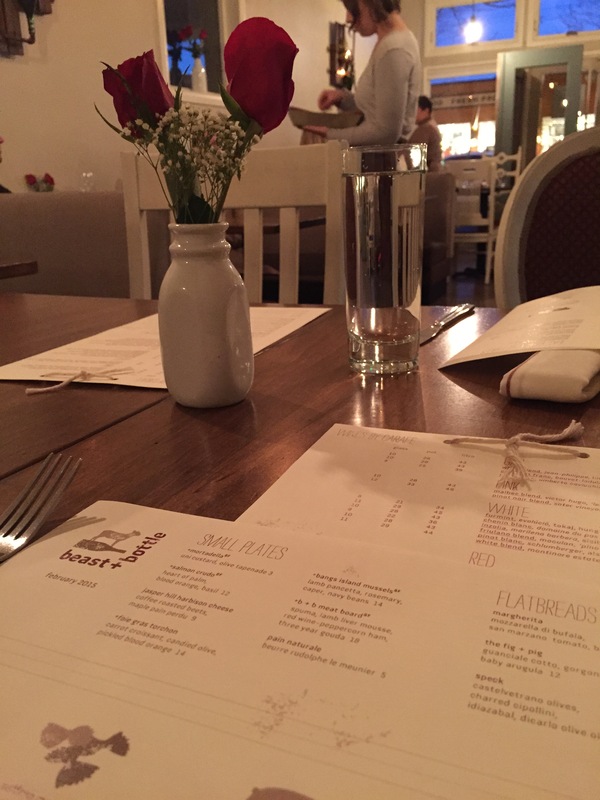 The past few years we had picked a new place to dine on Valentine’s Day and were constantly disappointed – by the service, the small portions, and the hurried atmosphere that stole the show of savoring a great dining experience. This year we decided not to go out on Valentine’s Day but instead something before and after. With that said, this was one of the BEST meals we’ve enjoyed in a LONG time. I had the pork special, the hubs enjoyed the lamb special, we split a flatbread, and gorged on amazing desserts. Need I say more, homemade strawberry Klondike bar. Whoa. What can I say, I like things in martini glasses. 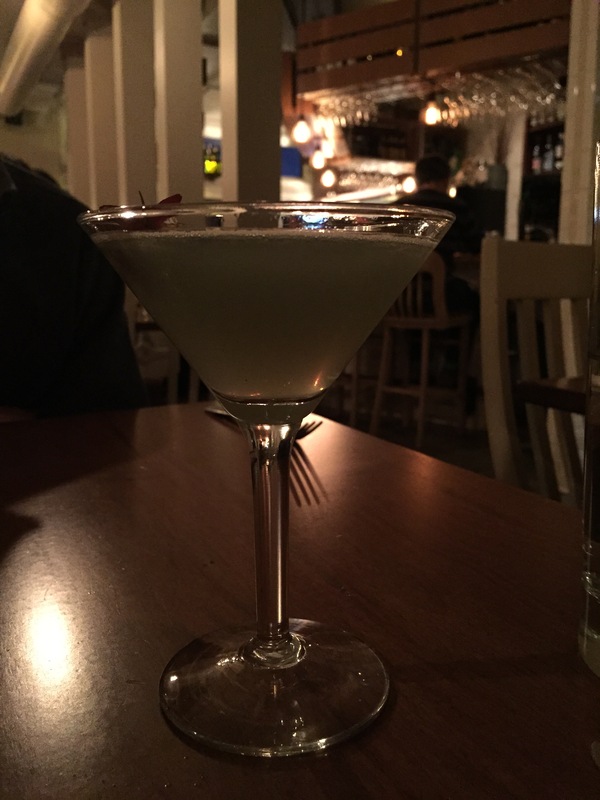 “Your Own Pear-Sonal Jesus” cocktail from B+B infused with pear and creme de violet. Perfect day to run with the one I love! For Valentine’s Day itself, I think my hubby and I have a new tradition. In November I registered for the Resolution Race series in City Park, and one of the races includes Le Cours de L’Amour (aka, the Course of Love). Needless to say, my hubby was happy to join me on this one. We ran really well together, finishing in just under 1:02 with a 9:58 pace. This race is much like the Lucky Laces (which is part of the same series) 10K I completed last year. 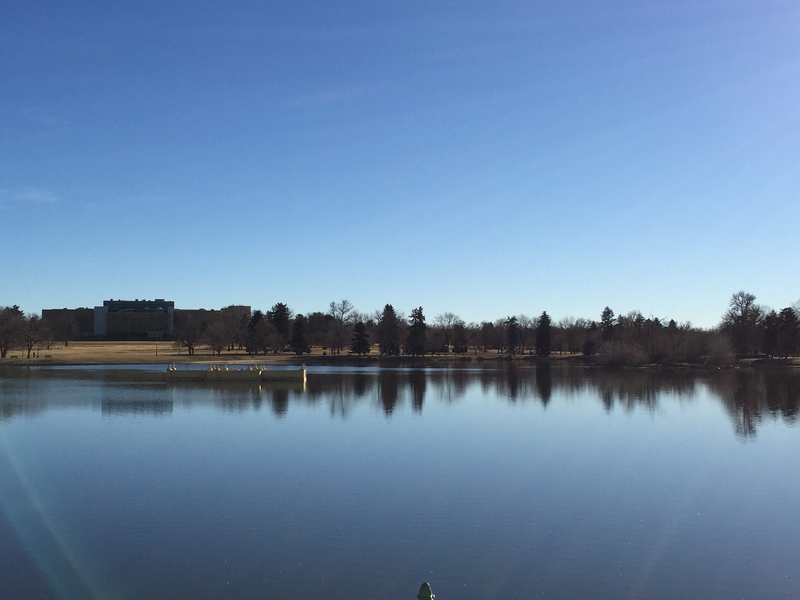 It is 2 laps of a 5K through City Park, which is quite lovely, with some great views of the mountains in the distance, and a trail that hits exactly at a mile high. The day was stunning, with a high of 65 degrees, a light breeze and wonderful morning sun. After the race, the ladies were handed a pink rose rather than a medal. Yup, Valentine’s Day threw up all over me. City Park really is a lovely spot to run, walk dogs, etc. Worth wandering through on a nice Denver day. Finally on Sunday, with winter storms looming, we went for a 4 mile run. We wanted to go further, but the snow storm brought on some fearsome icy gusts of wind that made it quite a challenge. 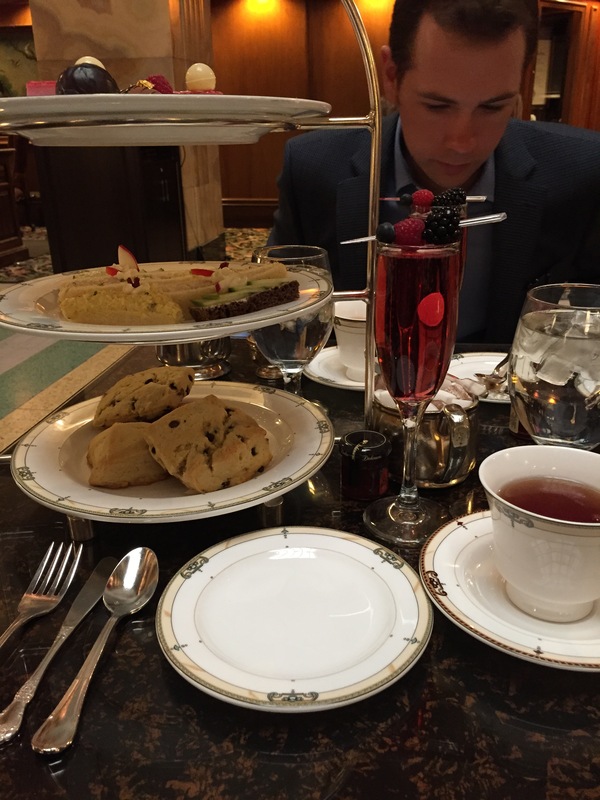 With a few more miles logged for the weekend, we donned our Sunday best and headed for the Brown Palace Hotel in downtown Denver for a picturesque and perfect afternoon tea. We were completely spoiled during our holiday in England and Scotland. 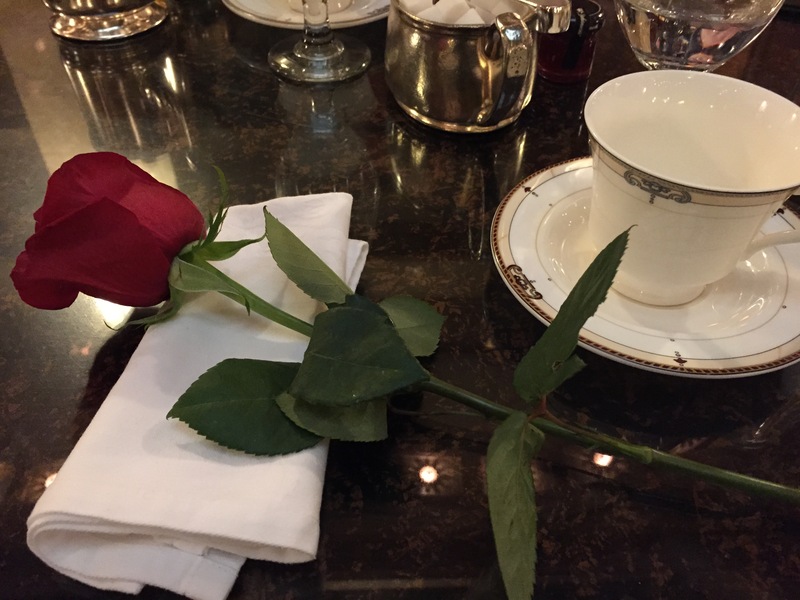 We enjoyed 3 afternoon teas whilst there, including the Pump Room in Bath, a Parliament tea along the Thames, and a Homecoming tea at the Edinburgh Castle. 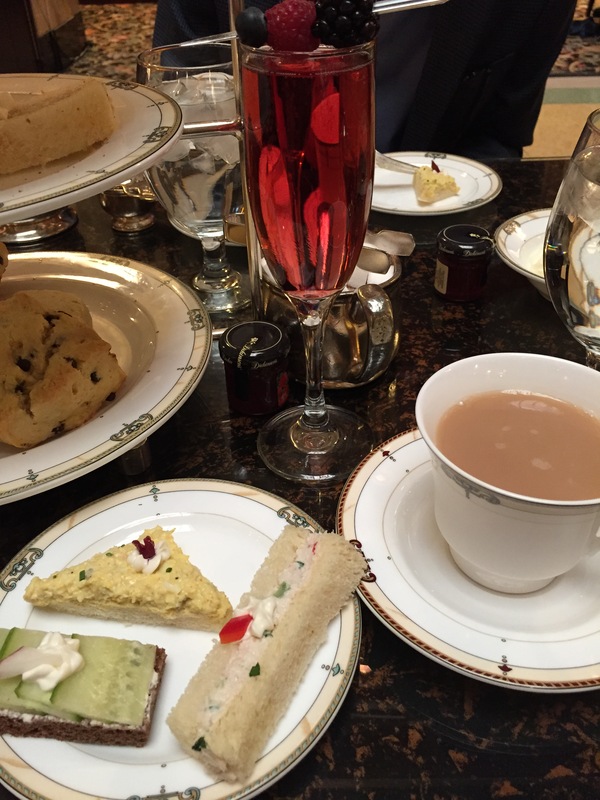 This was our first afternoon tea since returning to the states in September, and it was just the perfect way to end a busy and eventful two weeks. All I know is there is nothing better than exploring new places to eat, new races to run, and new adventures with my husband. I am one lucky gal. Gorgeous tea at the Brown Palace and my favorite date. That is a good spread, complete with Kir Royal. 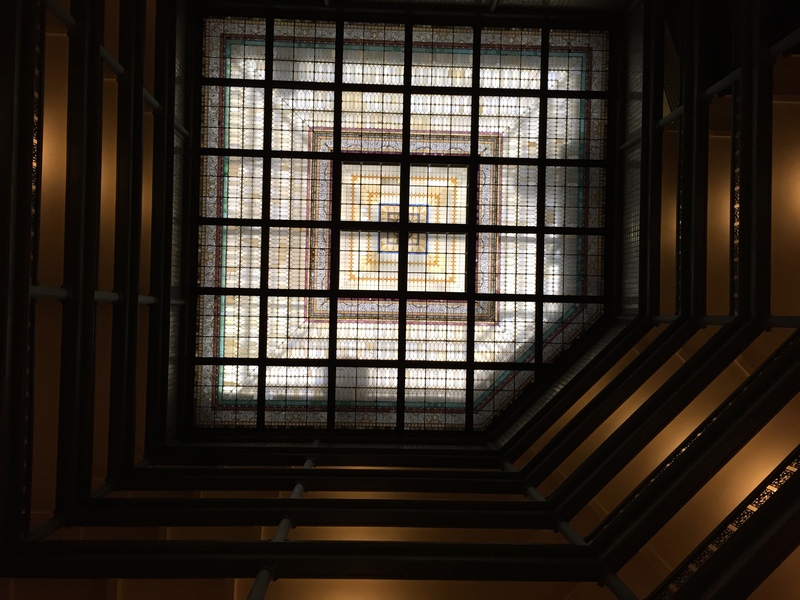 If you haven’t been to the Brown Palace in Denver, go on a sunny day, stand in the middle and look up. The stained glass ceiling is breathtaking. Can you tell I was excited? It is my go to pre-race face! 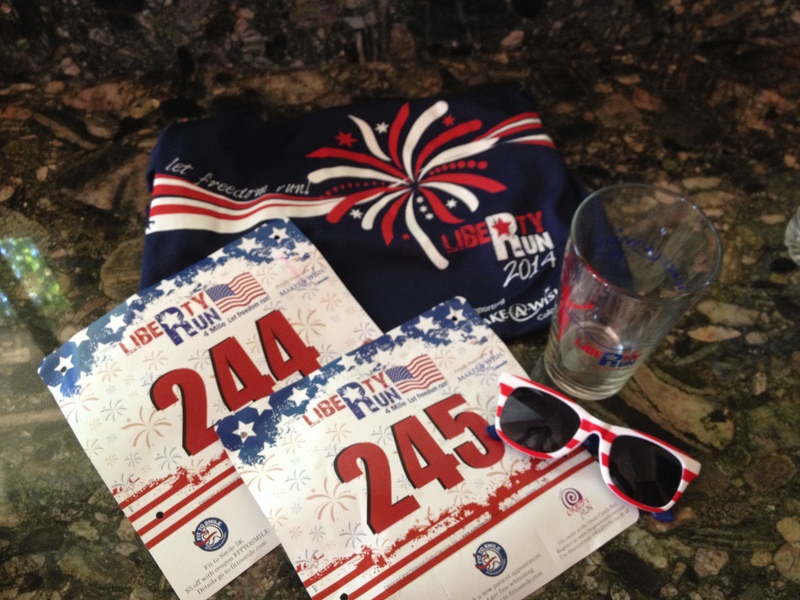 It’s time – the LONG overdue race recap of the Liberty Run 4 Miler in Washington Park on July 4th! This was one of my favorite small, local races to date. Everything about the race was so well organized, carefully planned, and just plain fun. 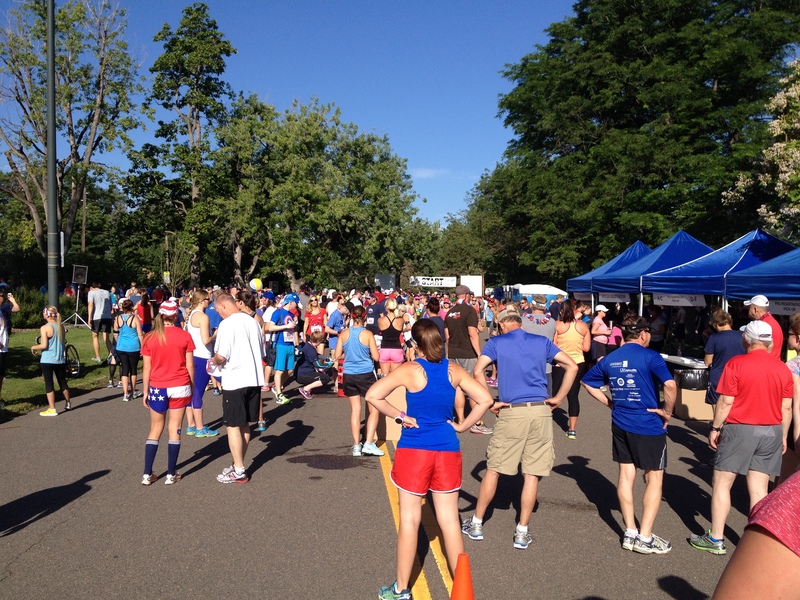 The race began at 8:30am at the southern edge of Wash Park in Denver, right along E. Louisiana Avenue. As per usual, the emcee was making announcements, commenting on the awesome patriotic ensembles, and pumping up the crowd. Packet pickup occurred race day, and was a very smooth process. The hubs and I picked up our bibs and awesome tech tees, dropped off the goodies at the car, and prepped for the race. This race contributed towards the Make-a-Wish foundation, which is a charity I have always admired. Fulfilling incredible wishes for ailing children will always tug at my heart strings. Furthermore, all of the volunteers were absolutely incredible – decked out in red, white and blue attire, completely friendly and cheerful, and full of great energy for all of the runners, walkers, and kids participating that day. Before the start of the race, the emcee directed us through our pre-run warm-up: the Chicken Dance! It was pretty cute, I must admit. And finally it was time to run! 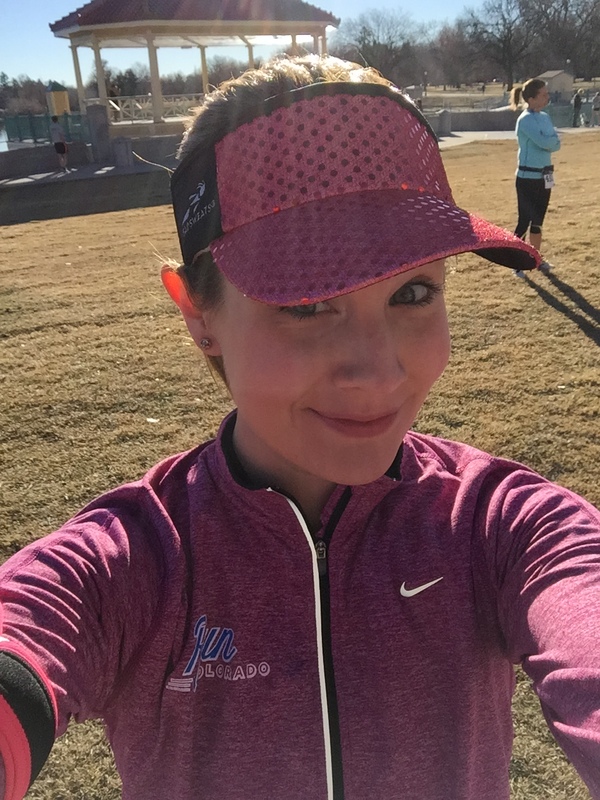 The first wave included the more seasoned athletes, then runners, and finished with the competitive race walkers (it is an impressive sport, and to learn more, check out the T-Rex Runner’s recounting of her race walking experience!). Pre-chicken dance race line up. Gotta love that red, white and blue! The first mile took a loop around a third of the park, and then back through the starting line to begin a loop around the perimeter of the entire park. It was a lovely morning, but incredibly humid for Denver (about 85% humidity when we started), so the weather warmed up quickly. There were two water stations on course, which we very welcome. Once the perimeter loop was complete, we ran back through the starting line and took the smaller loop through to the finish line. I was particularly pleased with the post-race loot. Upon finishing, the emcee was great about cheering folks on and maintaining momentum. Volunteers were there with bags for us to grab the incredible loot that we could line up for. Once in line, there was free sunscreen, awesome beer glasses, packs of Tylenol Allergy/Sinus, and other great giveaways. Naked juice was handing out smoothies, and BornFit provided the great race day tech tees. My favorite RunColorado store had a booth promoting their running gear. It was all around a fantastically represented and coordinated race. Following the Run/Walk portion was a Kid’s Firecracker Fun Run, which looked like a blast. The best part was seeing the costumes and creative ensembles. There was a legitimate Captain America (complete with head gear), and tons of red, white and blue all over the place. My favorite group of runners donned kid-sized animal innertubes, fun sunglasses, and tossed beach balls all throughout the race. They even had water squirt guns and cooled people off as they ran past. They were my new best friends for about 30 minutes. 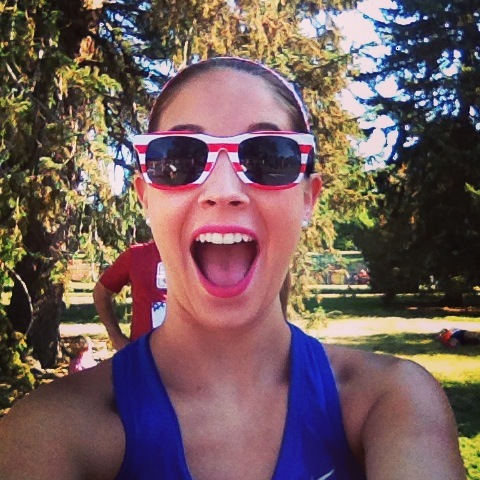 I decided to recycle my BolderBoulder outfit, but this time paired it with my Patriotic starry Sparkly Soul headband. I managed to attract a fantastic group of volunteers who would yell “SPARKLE SKIRT!! WOOO!! !” each time I made another loop around the course, which obviously made my day. The hubs donned a blue RunColorado shirt, although I couldn’t convince him to rewear our patriotic sunglasses. I would love to run this race again next year. I do wish it had been even half an hour earlier given the heat and humidity of the day, but otherwise it was a superb race. So much fun, great energy and atmosphere, and the perfect way to start the holiday weekend! It made me feel less guilty about the giant burger I consumed later that day. What can I say? The hubs makes a mean burger – on a pretzel bun, to make matters awesomer. Check out this amazing race day video! The hubs and I managed to repel the cameras that day, but it’s such a perfect way to showcase the race! What has been your favorite small, local race? Don’t you just love the 4th of July (yeah, Americuh!)? How do you feel about races less than 6 miles? 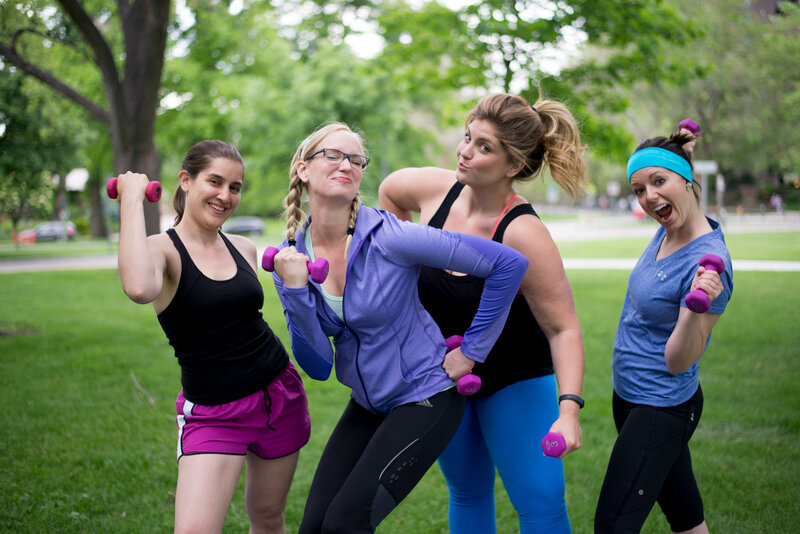 The class incorporates barre, boot camp, pilates and a whole lot of fun (and shared groans and laughter), which is just what I had been looking for. I thought I was in pretty good shape, definitely the best shape I have ever been in. I was wrong, terribly wrong. The class I attended took place in Denver’s Washington Park, more commonly referred to as Wash Park. We began the class with a four minute warm-up run around a portion of the park. No problem, I thought to myself, I can totally handle this. We followed-up the run with barre-style leg circuits. I wasn’t too worried about that, and although tough on the thighs, I can handle a little extra leg strengthening. After the first circuit we did modified mountain climbers for 30 seconds followed by a one minute sprint. Easy peasy. I made it through, and I am definitely motivated to keep going. Amy did an amazing job pushing us on, pumping us up, and making sure we knew why we were doing each exercise. She explained the benefit of this workout format, how each movement contributed to our strength and our muscles, and made sure we had fun all the way through. I cannot wait to go again this Thursday. As she mentioned, each class is different, so you never get into a “routine.” My goal is to be able to complete the core circuits easily (maybe not perfectly, but easily) by the time this summer is over. To say that I could still feel my abs through the weekend would be putting it lightly. It hurt to laugh. Getting out of bed in the morning was an actual struggle, and not just because I was sleepy. Hats off to fitness instructors – I dream to have your core strength one day. And to not feel pressure every time I give a good chuckle. Fabulously girly dinner for Danielle’s birthday! This weekend was all about celebrations! 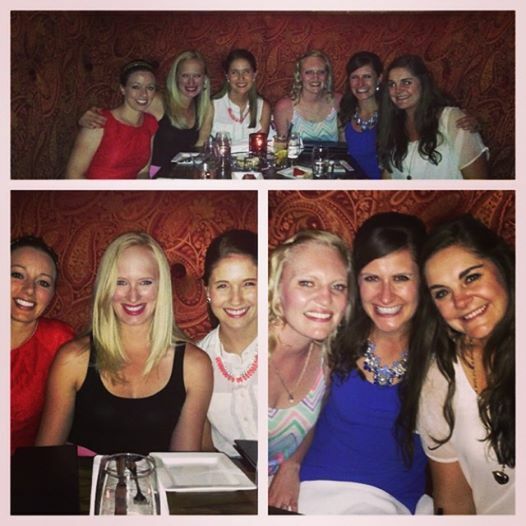 Friday night I spent the evening with some amazing ladies celebrating my friend Danielle’s birthday. We went to the 9th Door in Denver, a fancy tapas restaurant with a chic, mysterious vibe. We all had a great time over tapas and drinks. 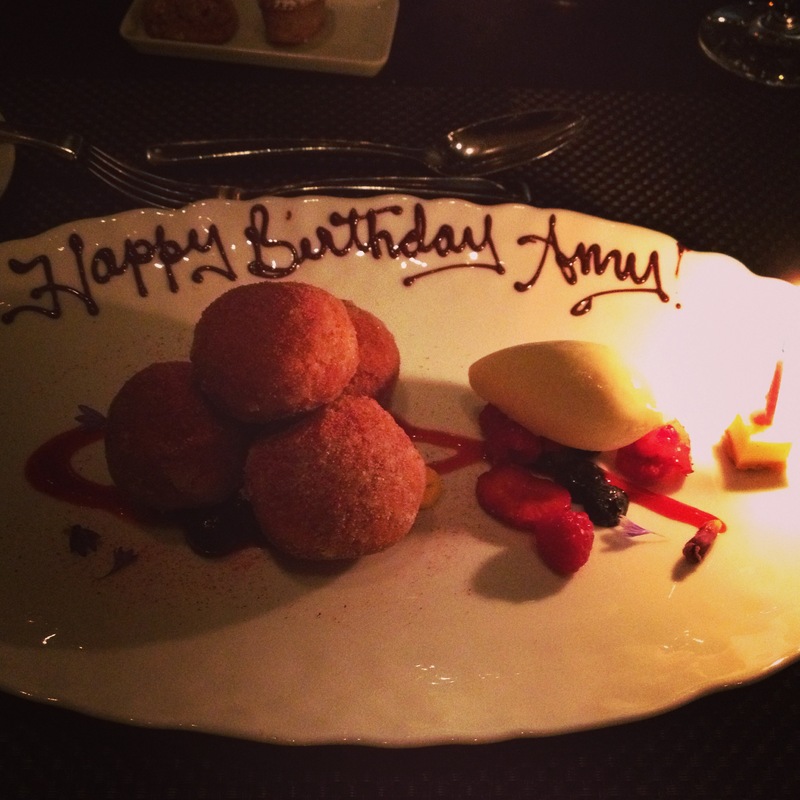 Danielle’s weekend was full of surprises, as planned by her boyfriend Scott (our Foodie Friday pals!). She and Scott spent the day up in Boulder, doing all of her favorite things. The day was topped off with AN ENGAGEMENT!!! I am so incredibly excited for them both and can’t wait to celebrate with them soon. 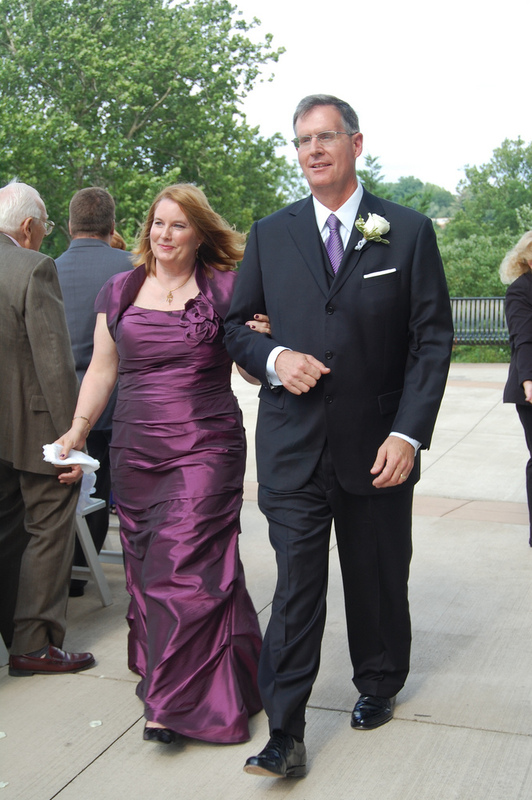 Happy anniversary to my amazing parents! long. It’s been an incredibly beautiful whirlwind of a journey together, and I am so eternally grateful for all the blessings I’ve experienced in my life. Have a great week everybody! Yup, that’s right, we WON in Vegas! 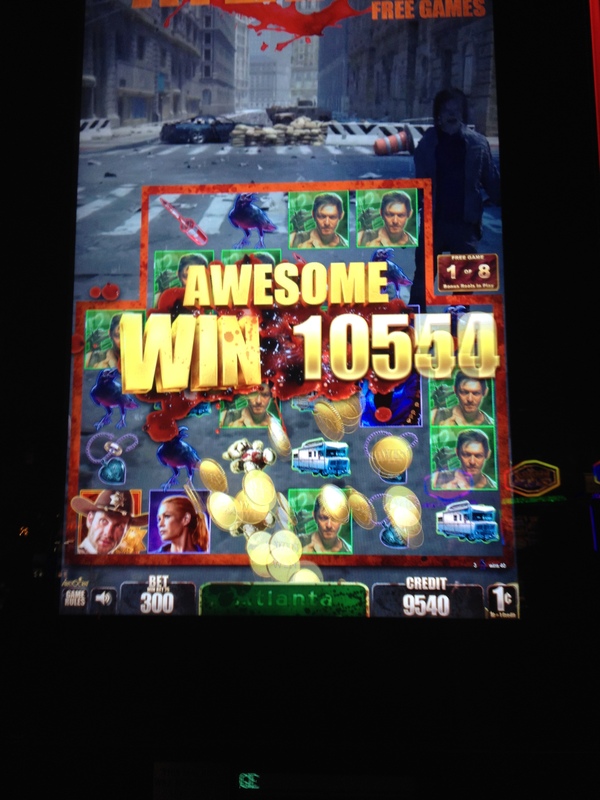 All thanks to the Walking Dead slot machines. and adventures, all topped off with a job I love and a city to call my own. This past weekend was my birthday weekend, and I requested one thing from the hubs: a trip to Las Vegas. Given its proximity to Denver, unending food options (I am a foodie, that often plays a part in my decision making), plethora of shops, non-stop shows and performances, and as my coworker put it, a chance to be glamorous, I knew it’d be the absolute perfect weekend getaway. So the hubs took my lead and made all of the plans, from the hotel, to the shows and restaurants. 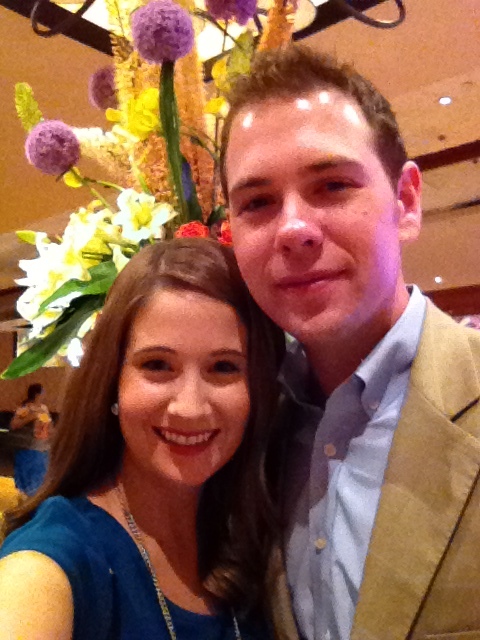 He planned the best birthday vacay possible – boy am I one lucky lady. And to top it off, we actually won money (yes, that’s right, we left Vegas in the positive monetary direction). Birthday Chai! Best boss ever. Given that my university hosts New Student Orientation each Friday during June and July, I wasn’t able to take off work that day. So instead, we planned to leave late Friday evening, at 9:05pm. I arrived to work in a daydream of the weekend to come, but was pleasantly, nay delightfully surprised by the incredible outpouring of birthday surprises from my coworkers. 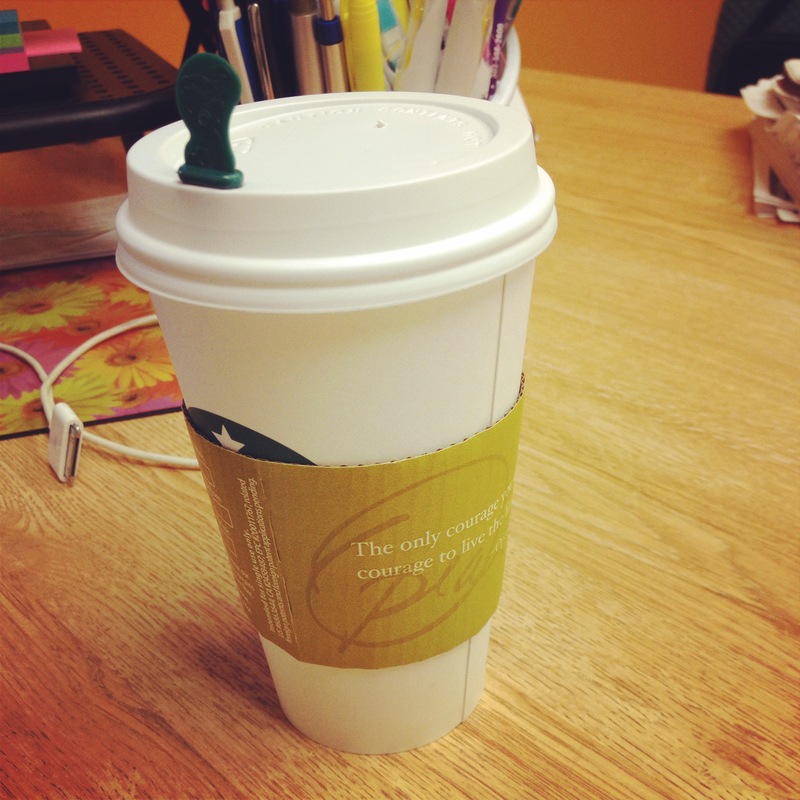 My boss brought me a birthday chai latte from Starbucks (she and I share a love of chai), while my coworker picked up Denver’s famous Duffeyrolls (light, fluffy, perfect cinnamon rolls – you simply must try them). 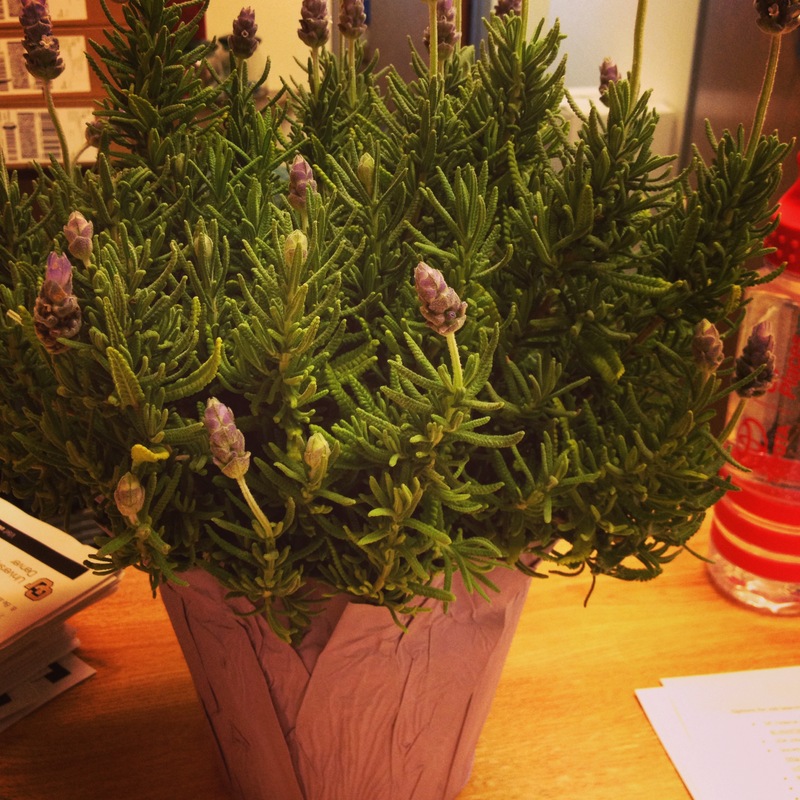 Finally, my boss’ boss arrived later that morning with a lavender plant in hand. I adore lavender, as does Robbie, for a number of reasons. Lavender lemonade may be the best invention ever, but lavender itself, I think, smells so wonderful and herby. 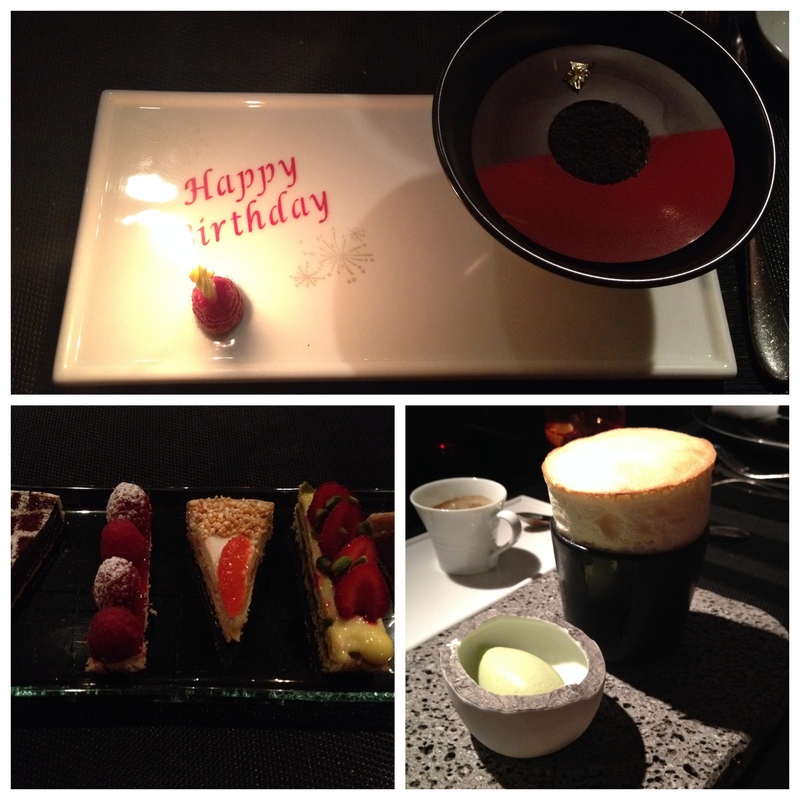 It was simply the best pre-birthday birthday celebration ever. Orientation went smoothly and the duration of the day flew by. What great coworkers I have! 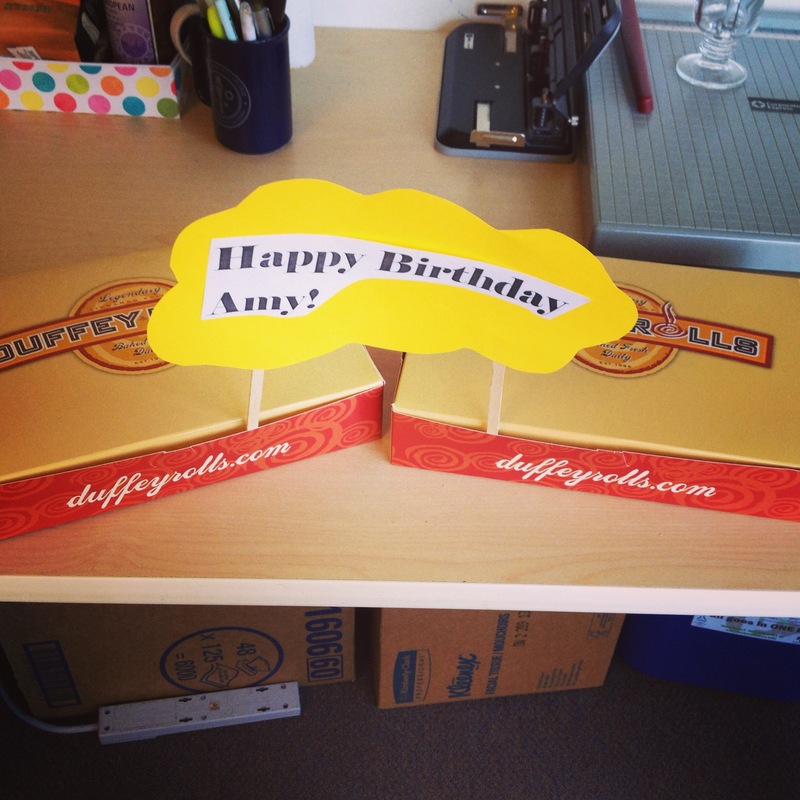 You must try Duffeyrolls – too delicious! The hubs picked me up from work and we went straight to the airport. Typically traffic on a Friday at 5:00pm is positively horrendous. The stars aligned, however, and we arrived quickly, parked our car, and were through security with hours to spare. We found Mesa Grill on the top floor of Terminal A, order margaritas and dinner, and enjoyed the ease of evening. A few hours later, we boarded the plane and had a smooth flight to Vegas. 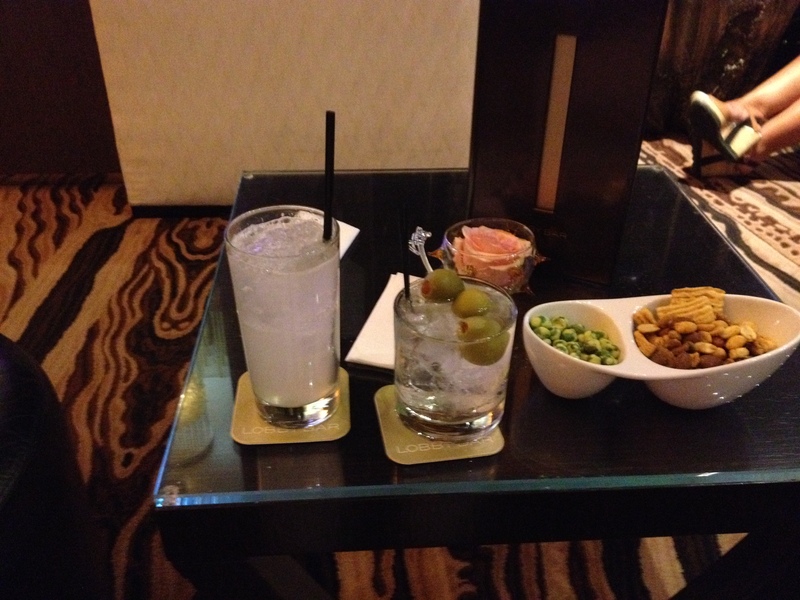 Pre-birthday drinks at the lobby bar, combined with epic people-watching. first time we’d experienced City Center, which is comprised of the Aria, Vdara and Cosmopolitan. All modern, luxurious-looking hotels with great amenities, close to the Bellagio and Mandarin Oriental, as well as Crystals, the shiny new shopping center. The Aria is an awesome resort, with a series of fantastic pools, good spa and salon, fun bars, and all styles of restaurants. I personally love the innovative air filtration system – you can barely smell smoke, even if the person is next to you (I am picky like that). Catching some rays at the Aria pool! Shortly before submerging myself in the delightfully cold water. headed to the gym and spa before getting ready for the evening. We had reservations at CUT, Wolfgang Puck’s unique steakhouse in the Palazzo. We arrived early so stopped into dbBrasserie at the Venetian. We have already decided to dine there the next time we visit, based upon the cocktails alone. Once the hubs saw they had quite the selection of champagne, he knew it’d be up my alley. 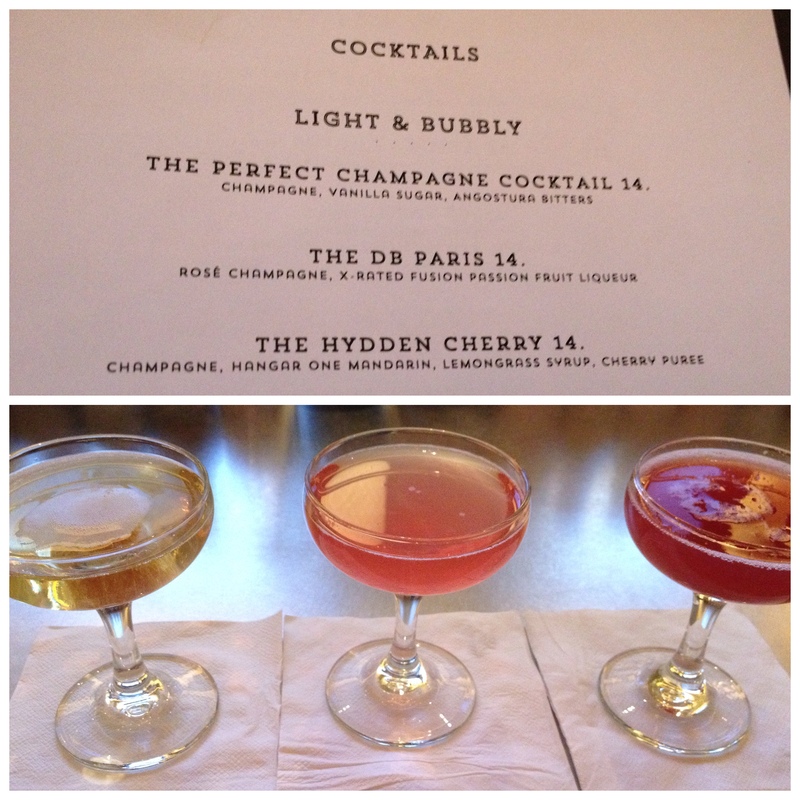 I ordered a flight of incredibly delicious, unique champagne cocktails and sipped them in utter delight. Afterwards we had our delectable dinner at CUT, which started with phenomenal steak tartar, followed by a perfectly cooked filet (for me) and amazing macaroni and cheese, and ended with the most perfect jelly filled donuts and crème fraiche ice cream. Whoa. So good. We followed up dinner with a short walk over to the Mirage to see Kevin James’ standup. He was spot-on and so funny. It was later that we found out that Billy Joel was performing at the MGM that night that we kicked ourselves a bit, but still a great evening overall. 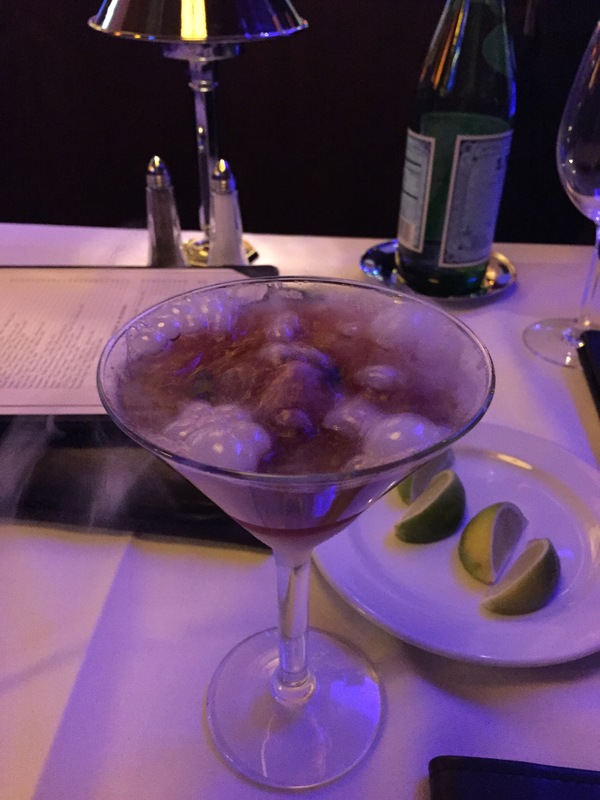 Best pre-birthday dinner drinks ever. I will be trying these at home. The desserts on this trip were legendary. 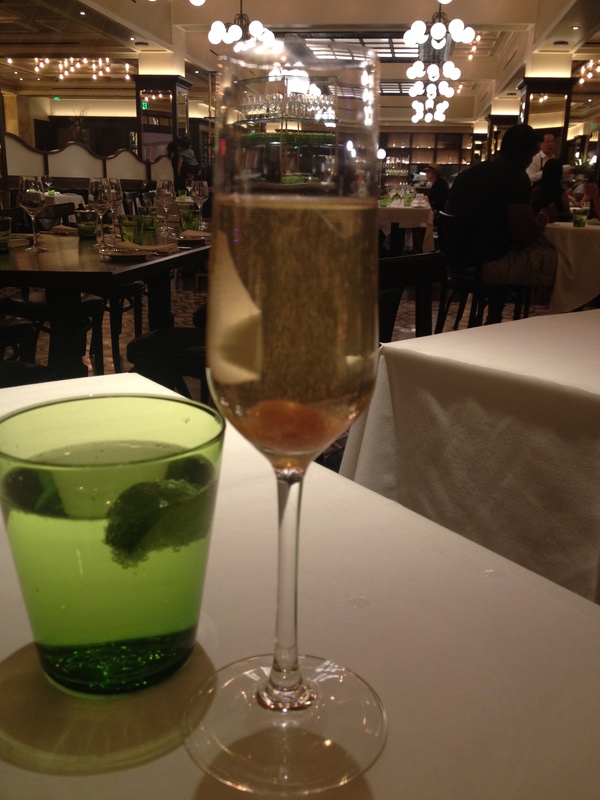 Lunchtime champagne cocktail – what could be better? to grab lunch at dbBrasserie (it was really that good, I cannot wait to go back for dinner), with another champagne cocktail of course (honestly named “The Perfect Champagne Cocktail”). We headed back to the Aria for more pool time, again followed by the gym (we are trying to be good, even on vacay), and prep for another amazing dinner and a show. That night we headed to the MGM Grand for dinner at L’Atelier. It was fabulous. The dining experience is much like eating at a sushi bar, watching the prep in the kitchen which is entirely open to the restaurant. Everything was so delicious. And rather than one dessert, we got three! Gosh I love my birthday… We ended the evening with my all-time favorite Cirque du Soleil show, Love. The entire show is set to songs from the Beatles, and therefore has a very British storyline. Many of the songs begin with in-studio recordings of the band telling jokes, working on songs and lyrics, and silly renditions of their greatest hits. It’s spectacular and I recommend it to anyone who loves the Beatles. This was my second time seeing it, and it still wowed me all the way through. Three desserts, not just one! All amazing, especially the Green Chartreuse Souffle! The next morning we had an 11am flight back to Denver, so we leisurely woke and packed before heading to the airport. 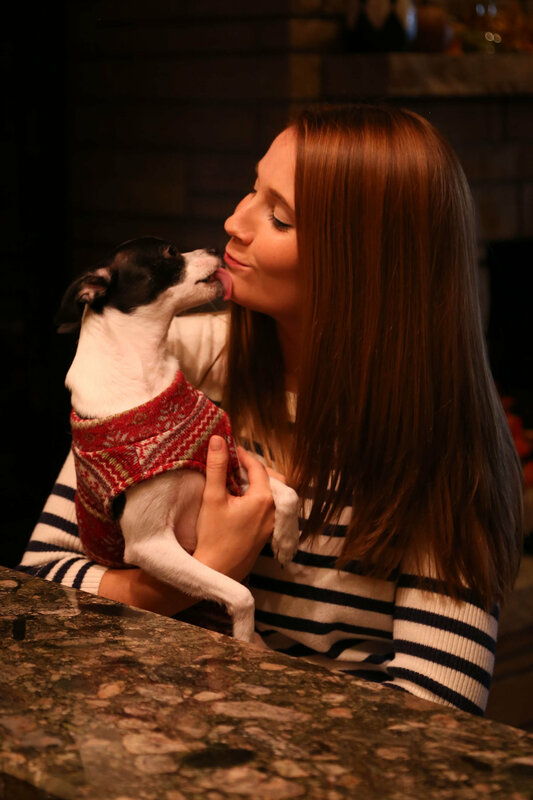 The only downside was having to leave our puppy for the weekend, but luckily my hubby’s folks and their pet Chihuahua were a great substitute family in our absence. I wish we could have had one extra day, but something tells me I may be going back again soon… Although it’s good we left when we did. An excessive heat warning was issued Monday morning. Temperatures exceeded 111º… Yikes! What a great hubby I have! What did you do this weekend? Where’s the one place you love going to for long weekend getaways? What’s your favorite thing to do, see or eat in Vegas? I live in Colorado, and apparently this means freak snowstorms, regardless of the month or season. Yesterday I woke up to a wintry mix of ice and snow, which eventually turned into just snow throughout the day. This weather anomaly continued through this morning, and has, hopefully, finally subsided. I didn’t realize that by moving here I was signing myself up for practically summer snow… where have my clear-cut seasons gone? Enjoying brunch with some of the awesome Denver ADPi’s! Despite my incredible sadness from the drop in temperatures and accumulation of unseasonal precipitation, I managed to make the most of my weekend. Although long outdoor runs were not in the equation, I was able to work in 4 miles on Saturday and a necessary trip to the gym on Sunday (thanks, but no thanks cruel and twisted weather gods!). 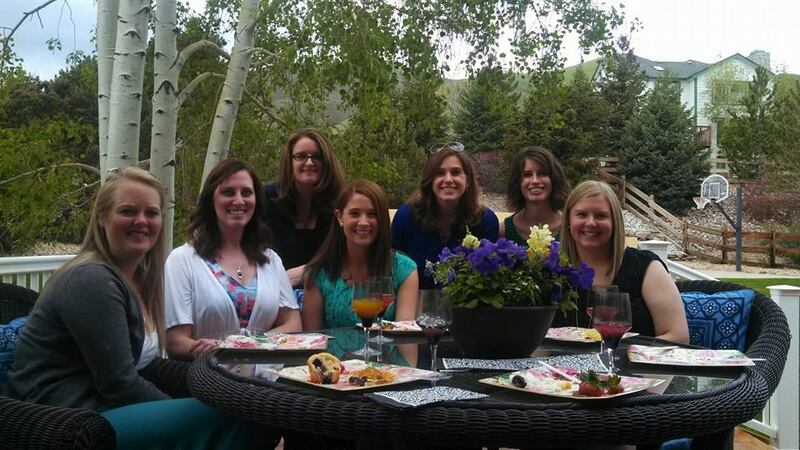 On Saturday, I celebrated my sorority’s Founder’s Day with nearly 20 women from the Denver metro area. Thankfully the day started off sunny and lovely, and we were able to enjoy a beautiful brunch at a sister’s home in Ken Caryl Valley. If you’re familiar with the Denver area, you probably know the enormity that is Littleton. I, however, did not know how far west Littleton stretched, until I was driving into the foothills and emerged into a beautiful valley, surrounded on all sides by lovely little peaks. I love that almost three years into living here, I am still discovering something new! For the event, each lady brought an item for the potluck brunch. Given that I would need to prepare something Friday evening, I wanted to make something easy and universally well-liked. Obviously that meant blueberry muffins! I love blueberries (hello, amazing source of antioxidants!) and I adore lemon, thus my lemon cakes. So what better way to usher in the summertime than combining my favorite ingredients? 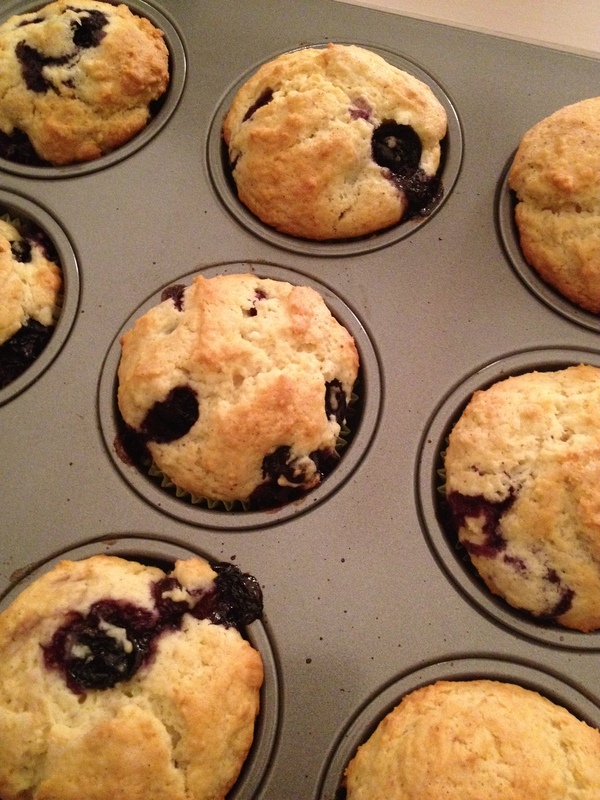 Blueberry muffins may be a favorite go-to for muffin-makers, but I have had many boring blueberry muffins in my day. Adding lemon really brightens the flavor and makes the muffins light and fluffy, rather than dense and dull. I found a fairly basic recipe on Foodnetwork.com but jazzed it up with a little more lemony flavor! Delicious, fluffy and perfectly springtime. Now where did spring go? Whisk the flour, sugar, baking powder, salt, and nutmeg together in a medium bowl and set aside. Melt the butter, and then whisk the cream, eggs, lemon zest, lemon juice and vanilla with the butter. Make a small well in the center of the dry ingredients. Pour wet ingredients into the well, then stir with a wooden spoon until the dry ingredients are moistened but still lumpy. Do not overmix the batter or your muffins will be dense. Gently fold in the blueberries. Divide the batter evenly into the muffin tin and sprinkle the tops with vanilla sugar or granulated sugar. Put the muffins in the oven and immediately reduce oven temperature to 375 degrees F. Bake until golden brown, about 25 minutes, rotating the pan halfway through the cooking. Insert a toothpick into the center of a muffin to check if it is done. Toothpick should come out clean. Cool muffins in the pan on a rack for a couple minutes. Turn the muffins out of the pan and cool on the rack. Serve warm or at room temperature. 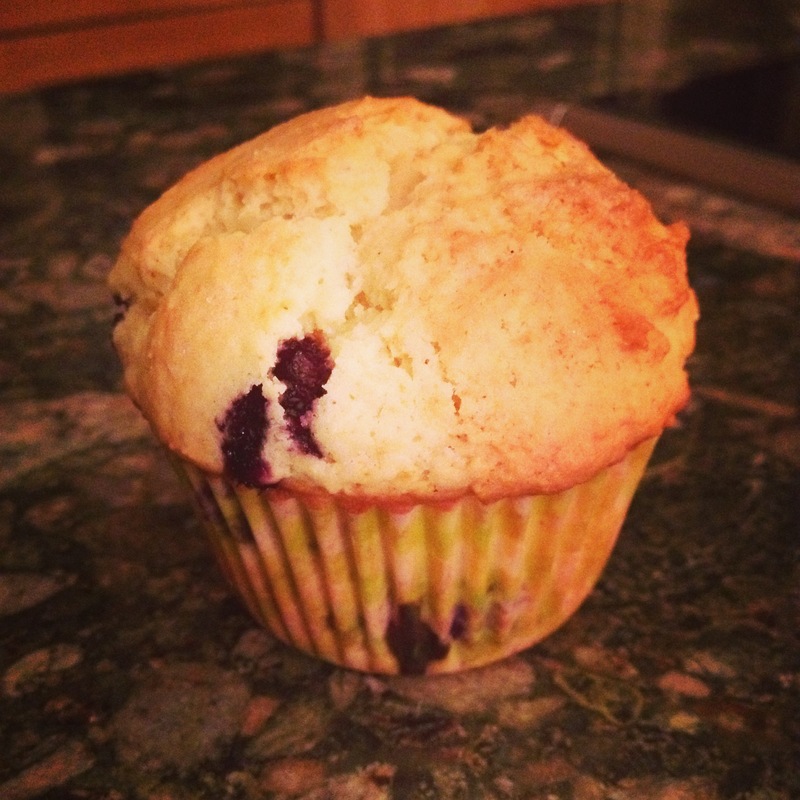 Who doesn’t love a good blueberry muffin? We’ve of course been planning this trip for months, and I am just as excited about the weekend activities as I am about the race itself. 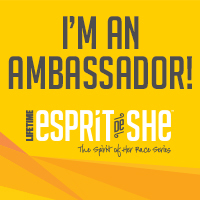 I arrive in DC Friday night, April 25th, and we plan on popping by the Expo (yay Nike gear! ), then grabbing dinner in Arlington and seeing where the night takes us. The following day will be relaxed and rather fabulous. I requested a trip to a Lilly Pulitzer store. I have had to seriously sacrifice my inner, and outer for that matter, preppy by moving to Colorado, so I need to restock on some Lilly. I know I can shop online, but I am looking for more than just clothing. I am looking for an experience. We’ll also be getting some manis, followed by a light lunch. My friend Samantha thought it would be wise to then go to the new Nike and Under Armour factory outlets in Leesburg. One can never have too many options for running clothes… I think. 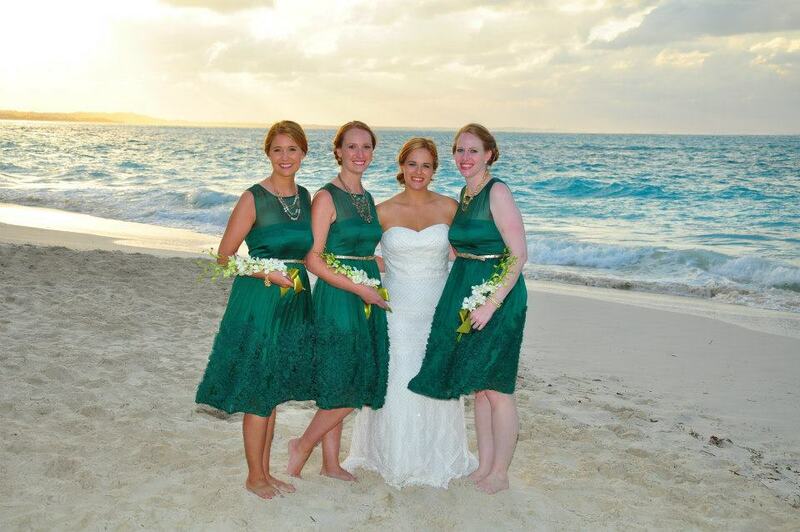 The four of us at Samantha and Michael’s wedding last March! This will be our first full reunion since then! That night we’ll hit the hay early, but only after a fabulous dinner from my friend Justine. She is a bit of a master in the kitchen, and has a great, filling, well-balanced meal planned. The morning of, we will run our little hearts out, and my family (at least my parents, hopefully my siblings too) will be at the finish line cheering us on! 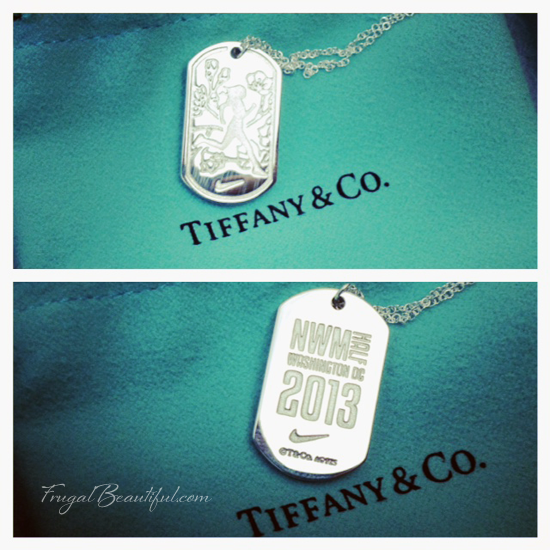 Once we grab out Tiffany necklaces (I guess I can forgo a medal for a little robin’s-egg-blue box of awesome), we’ll collect ourselves and clean up a bit before heading to brunch at Masa 14. Every runner deserves a little celebration post-race, and this will be our last hurrah for the weekend. It really is a dream come true being able to share this weekend with three of my favorite people, and definitely a bonus to actually have my family there to see me run. I was not a runner by any stretch of the imagination while I lived on the East Coast, so my family still wonders what happened to the Amy they knew. I think the moment I cross the finish line, with my friends by my side, and my family looking on, will be one of the best moments I’ve had. I know it’s one I will cherish, and I am so grateful for the opportunity! What have been some of your favorite race moments? Is there a race coming up that you are especially excited about? Do you love running with your friends or hitting the pavement solo? 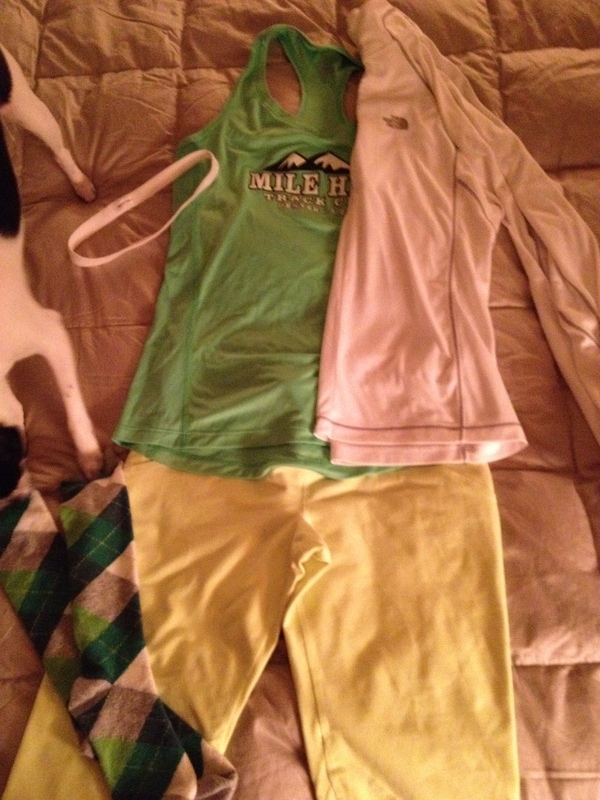 Tomorrow morning I will be running the Lucky Laces 10K in Denver’s City Park. I’ve been wanting to do a longer local race in Denver. I’ve really only participated in Denver 5K’s up until this point, and although fun and easy, you never get a great feel for the truer running community. The BOLDERBoulder, being such a large 10K event, is really more a giant party with people from all walks of life, and from all over the world. Again, not a true indicator of the region’s running community. I also was yearning for an opportunity to run a distance race on my own, simply to see what I can do in a race setting. This is my shot, and I am extremely excited! The morning will start with some great Celtic music, in honor, of course, of St. Patrick’s Day weekend. Around 8:30am kids and families will line up for the fun run, and by 9:00am, the 5/10K will start. Initially I was just planning on doing the 5K, but if it’s just me running, why not push myself? 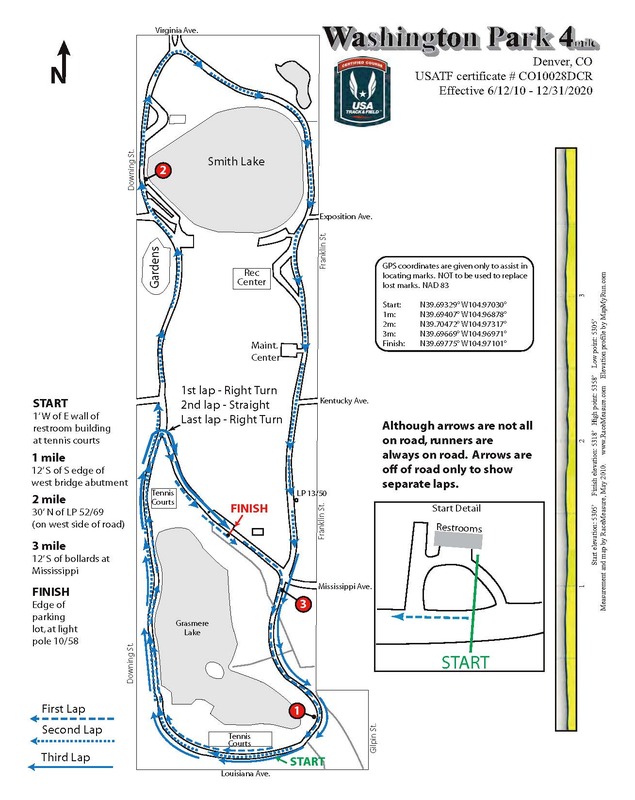 The 10K will take 2 laps around Denver’s City Park, and end with pancakes, sausage, and yes, Odell’s Brewery beer! Who wouldn’t want to drink a delicious brew at 10:00am? 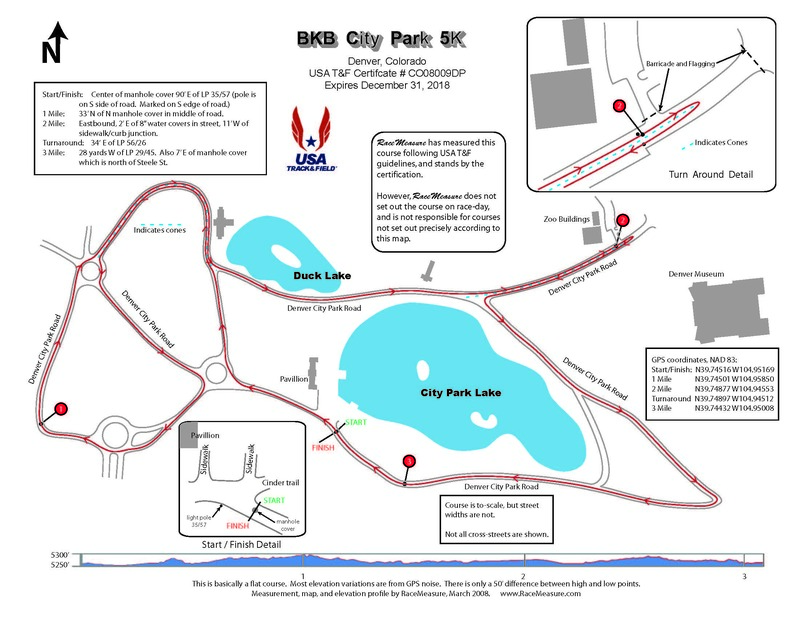 The course for the 5/10K around Denver’s City Park. 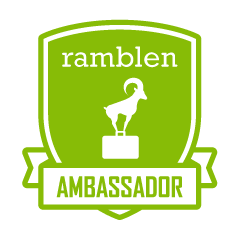 Not only do you get fame and glory for this race, but there should be some good swag. I love swag in a sad way. The tech-T was already mailed to my house (which of course I cannot wear until the race is over, bad juju people!). Beyond that, participants are promised a T-shirt, medal, goody bag, and event pictures. Not too shabby for a smaller race! One thing that I am very intrigued about regarding this race is the use of an app called Bibs. This app is supposed to allow you to check your time directly upon completion of the race, check the course map, and provide family a friends a way to track you on the course. I am hopeful that this will be a great tool, and will report back on its usability and accuracy post-race. It looks like the weather will hold out for tomorrow, with partly-cloudy skies and mid-40 degree temperatures. Regardless, I am prepared for the ensemble. Yet again, the outfit played a major role in my preparation for the event. I’ve also requested a snake bite black later in the day. It is St. Patty’s Day weekend after all, and I am Irish. Partly. Yellow, green and grey argyle socks will be my statement piece. Rocco also approved. What are your St. Patty’s Day weekend plans? Do you like to party like those crazy Celts or stay in and sip green beer? Any upcoming races that you cannot wait for? Do you know of any other great running/tracking apps being used in the race community?